WATCHMEN – It’s where I assign a hot new release characteristically with one of the five key heroes from Watchmen. As for January, if it were a guest on Sesame Street it would be brought to you by the word 'new'. New Year's Day, new resolutions, new beginnings and as these five show, great reads for new (or formerly new) readers. 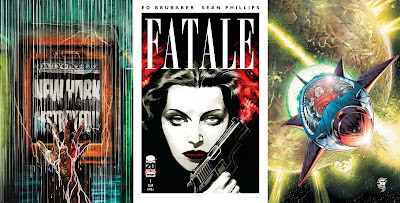 DR MANHATTAN (The Neon Blue Guy In The Room): FATALE #1 (Image) She's as smokin' hot as her pistol, despite having been on the run since the 30's, and he's a mobster who is literally a demon at heart. And you thought good couples were only created on The Bachelor. Pulp fans lock'n load - this is goin' to be a beauty! 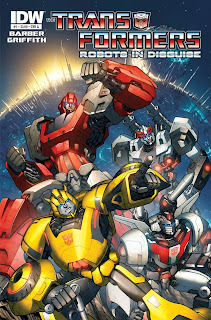 THE COMEDIAN (My Rank Outsider): TRANSFORMERS: ROBOTS IN DISGUISE #1 (IDW) What's bigger outside comics right now then Transformers and maybe that global warming thingee? Well just don't tell fans of the former Optimus Prime died this month and chuck them in front of the two new follow up series from IDW! My pick, TF: R.I.D. follows 'Bot leader Bumblebee, as he, the Decepticons and robots who dont identify with either, try to reclaim a Cybertron gone mad! NITE OWL: (The Dependable Goodie) AMAZING SPIDER-MAN #678 (Marvel) In the last decade no hero has needed a brand new day like Spider-Man (no I'm not taking it back, I know what I did there), and now it's finally happened. Spidey's new, fun - and better yet actually funny - modern adventures, have become my after grocery shopping treat (pull list and budget be hanged)! Next up, Pete destroys New York in 12 hours. News at 11. 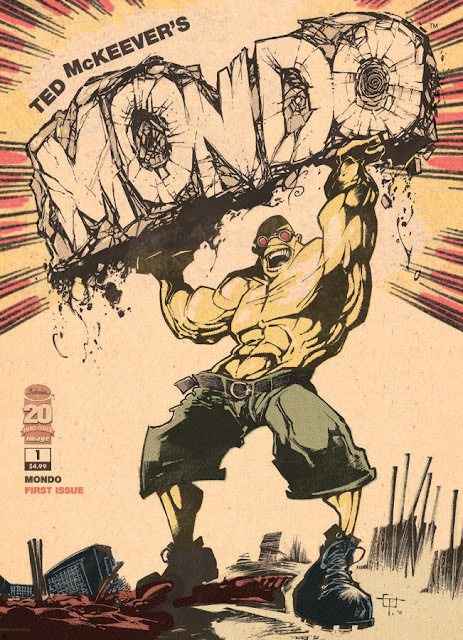 RORSCHACH (The Indie Voice): MONDO #1 (of 3) (Image) I just can't stop staring at that cover. It's like The Incredible Hulk meets the henchmen from Despicable Me, and that's pretty much it. After a routine poultry enhancement goes wrong, Catfish is the victim of his own super soldier serum of sorts, taking him smack into the path of Kitten Kaboodle! Golden age format, "chicken enhancing" and 48 pages - what's not to love?